To be clear, the Remington Model 783 has a reason for the numbers. The “7” is for the model designation as being in the 700 line of rifles. The “8” is to reflect back to the Model 788 which was discontinued over 20 years ago. The “3” is for the year 2013ii. So now you know the reason for the number “783”. The Remington Model 700 has been the standard for the Remington brand for more than five decades and still going strong. The Model 783 was not introduced in 2013 to compete or even replace the Model 700. Rather, it was engineered and placed in the market to compete against competitors such as the “Savage Axis”, the “Tikka T3” and the “Ruger American Rifle”. These guns have shown that sacrificing accuracy is not a matter of price. The question of “can I have an inexpensive rifle and still have accuracy” came into play. The answer was a resounding “yes”. Remington also wanted to keep features that are important to hunters. A superb trigger, pillar-embedded stock and free-floating barrel inclusive of a target crown, to name a few! However, since this article is about comparing the Model 700 with the Model 783 we will do our best. It will mostly be a descriptive review of the Model 783, with the assumption that the readers are already familiar with the Model 700 due to its popularity and long history. The Model 700, by its design was a top loading gun. This means that there is no metal going over the top or the bolt. However, the 783 is magazine fed. This creates a smaller ejection port, creating a frame that is more rigid. It would be assumed that the machining time from this design would be reduced as a result. The detachable box magazine is metal, not plastic. It is easy to load, not having to be concerned about the plastic box inability to sometimes not load properly. Just place on bottom of rifle and give it a snap. The Model 783 did not sacrifice accuracy for price. It has a one-piece cylindrical receiver and small injection port. The accuracy is improved due to more mass and rigidity passing through the receiver. In addition, the trigger and the barrel are considerations for accuracy. The barrel is magnum contoured, 22-inchor 24-inch button-rifled fitted with a barrel nut. The trigger is user adjustable, but is factory set at 3.5 pounds. This feature alone makes the Model 783 become a much more personal rifle to the user. The experienced non-Remington field-testers that were the first to test the rifle for accuracy all came down to the Model 783 being a very well manufactured rifle, with extreme accuracy that was in the inexpensive price range. A big win against the competition! Available in 270, 308, 30-06d and 7 mm Rem Mag. It was a little difficult to compare the Model 700 to the Model 783 simply because one was not meant to replace the other. It was to answer to the charge of competition of producing a rugged, inexpensive and accurate rifle. The Model 783 was also manufacture for durability, ruggedness and to produce in the hunter the knowledge that this rifle was made just for them personally. We trust you enjoyed this brief description and comparison. Now go out, and enjoy the hunt. Betty Norris. "Differences between the Remington 700 and 783." DifferenceBetween.net. July 14, 2016 < http://www.differencebetween.net/miscellaneous/differences-between-the-remington-700-and-783/ >. Someone gave me a remington 78 in 06. However, itnis.missing the bolt. 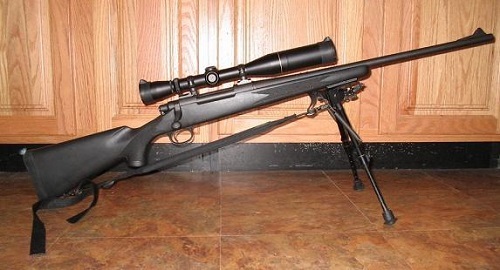 Will a remington 700 LA bolt work?